In House Endoscopy Now Offered At The Arbor Ridge Pet Clinic! 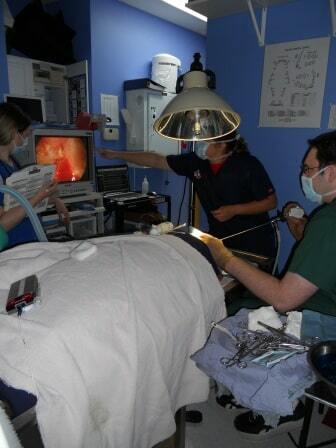 The Arbor Ridge Pet Clinic is pleased to offer in house endoscopy to our clients and their pets. This allows us to better diagnose problems in the upper airway, and the esophagus, stomach, small intestines, colon and the bladder. Our clinic has both rigid and flexible endoscopy cabibilities. 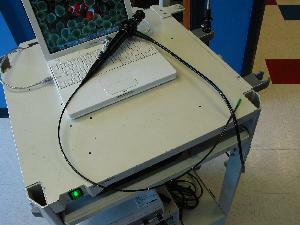 We have two special rigid endoscopes especially for esophageal exam. We have a specialized very small rigid endoscope with cautery, biopsy, scissor and forcep adapters for doing coelomic exploratories in reptiles and birds. We have flexible endoscopes for bronchoscopy, GI exploratories (stomach, small intestine and colon), and bladder studies in dogs and cats. We have rigid endoscopes for rhinoscopy (looking into the nasal cavities and sinuses). By offering this specialized test, we can save the client from having to go to a specialty clinic to have these tests performed.